Sure, this Chinese character means hand. But in Okinawa (where it's pronounced Te) it has a little more meaning in the context of martial arts. So much meaning in fact that well into the 20th century, the martial arts of Okinawa were generally referred to as Te 手. Not Budo, not Bujutsu, just Te. To specify a little bit more, they describe the system of Te that is the combination of Okinawan and Chinese arts as To Te 唐手 which means China Hand. In Korean, this is pronounced Tang Soo. It was so general in fact that in the 1700's there were several schools of Te from different regions of Okinawa that they used the regions themselves to specify the school. Those regions were Naha, Shuri and Tomari. So therefore the 3 main schools were Naha-te, Shuri-te and Tomari-te. Some notable masters from the Shuri-te school are Itosu Anko, Funakoshi Gichin and Matsumura Sokon. From Tomori-te, Matsumora Kosaku and Motobu Kokan. And from Naha-te Higaonna Kanryo and Miyagi Chojun. Moodukkwan Tangsoodo as taught by Hwang Kee is not descended from just one of these schools, but all 3. We use techniques and forms from all 3, but we are unique in that Hwang Kee gave us his personal style and transmission. A style that was uniquely Hwang Kee, and uniquely Korean. Though it is arguable that he borrowed much from Shotokan, (the Gicho forms, the changed order in the Pyongahn forms, the military aspect, etc...) the forms get less and less Shotokan after Pyongahn. It's important to always remember, Moodukkwan Tangsoodo and Shotokan Karatedo are brothers... not father/son. So it's obvious that in Tang Soo Do, we borrow much from Te 手. Now let's look at the actual character. 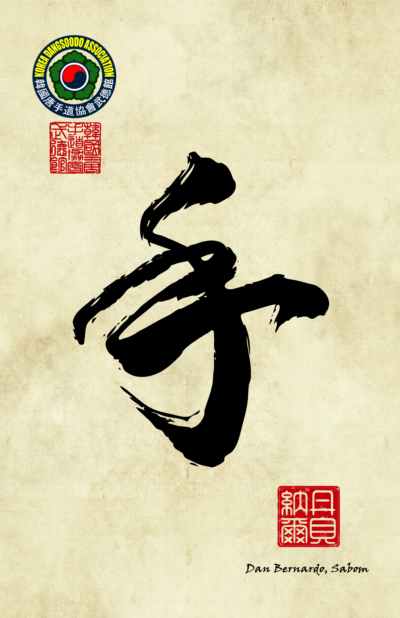 Chinese script is one of, if not the oldest systems of writing in the history of Mankind. Like all other ancient writing systems it is pictographic in nature. Therefore the character for "Soo" is a picture of a hand. The top stroke is the bent over middle finger, while the horizontal strokes are each two fingers. Tang Soo is not a weapon based art. It is an art, however, to be used against weapons. But it is not a weapons art.